As one would expect, the initially empty space surrounding the rapidly expanding use of cardiac CT strongly attracted enterprising individuals with a variety of backgrounds and training. The sudden realization that we could noninvasively image coronary arteries at high spatial resolution was a powerful draw for cardiologists who have always been fascinated by coronary anatomy. The striking views of the heart and vasculature that could be created using newer approaches such as curved multiplanar reconstructions and three-dimensional volume rendering also proved irresistible to radiologists. Given a history of struggles over ownership of other cardiac imaging modalities such as invasive or catheter-based coronary angiography and nuclear cardiology, it is not altogether surprising that tensions also developed in this new landscape. The term “tribalism” refers to a strong cultural or ethnic identity that separates one group from another. In medicine, tribes are most often defined by specialty or departmental affiliations. 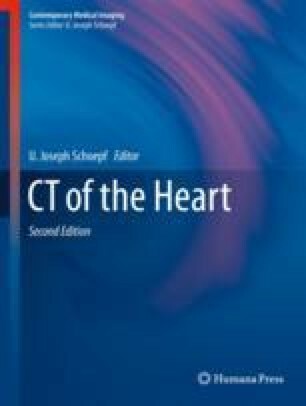 The conflicts that exist regarding the modern practice of cardiac CT generally relate to debates over which medical specialty is best suited to oversee the equipment and technologists, the interpretation of the images, communications with referring providers, and the financial aspects of the service being rendered.